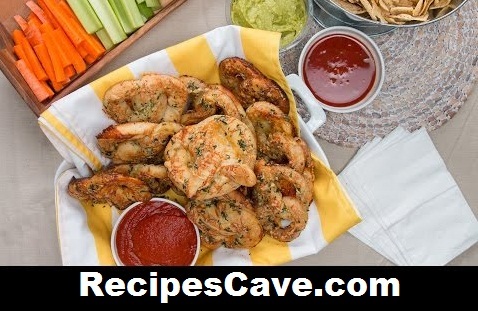 Cheese Recipe with Stuffed Garlic Parmesan Pretzels - follow simple steps to cook Cheese with Stuffed Garlic Parmesan Pretzels at home. 2. Stretch pizza dough out into a rectangle and cut into 8 equal-sized strips. 3. Stretch strips lengthwise, and widthwise. 4. Place mozzarella down the middle of each strip. 5. Fold and pinch the dough around the cheese along the entire strip, ensuring to close off the ends. 6. Form a pretzel shape by taking the ends of the strip, making a “U” shape, twisting the ends around each other twice and connecting the ends to the bottom of the “U” shape. 7. Transfer to a baking sheet lined with parchment paper. 7. Mix melted butter, garlic, and parsley and pour onto pretzels. 8. Sprinkle parmesan evenly on top of the pretzels. your Cheese Recipe with Stuffed Garlic Parmesan Pretzels is ready to taste.